Do you love Papayas? A popular Taiwanese drink that you'll find street vendors selling is Papaya Milk. It's kind of like a tropical papaya Smoothie or Shake. One of my early childhood memories is of my Grandfather and I walking up to a street vendor (in Taiwan) and him buying me my first cup of Papaya Milk. You don't really see this drink sold here in the US, but it's easy to make at home with ripe papayas. It's also a great option if you have a bunch of papayas that you aren't able to eat right away. Just cut them into cubes and put them in the freezer for making this tasty drink. Ready in Total Time: 3 min. 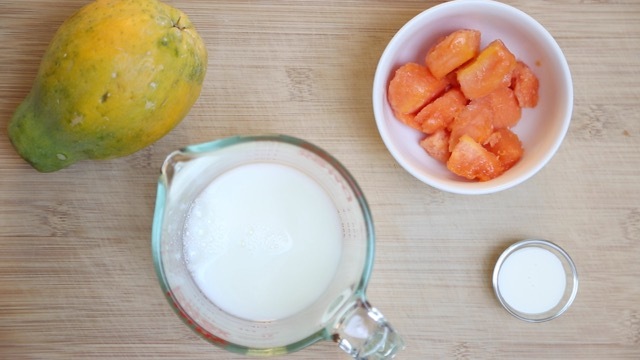 Blend the frozen papaya cubes along with the milk and optional sweetened condensed milk. Note: I'm using a Vitamix personal sized blender in this video. Some advice on blenders: After owning both a Blendtec and NutriBullet, I can say the Vitamix is my favorite to use because it blends ice the best for smoothies + it's got a small kitchen countertop footprint.